So this post was supposed to be brought to you by the Mr. Yes, a baking post from my hubby. Once fall rolls around he usually throws together a loaf of bread in the bread maker every weekend, but one Sunday he decided to try his hand at bagels and they were awesome! Since then he has been experimenting with different flavors and has been wanting to try pumpkin, but he ended up glued to his computer working all weekend (boo!). 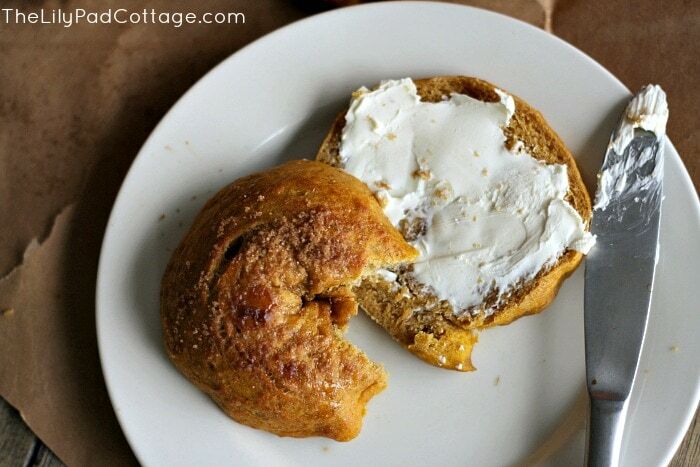 So I tried my hand at it and came up with this yummy pumpkin spice bagel recipe. 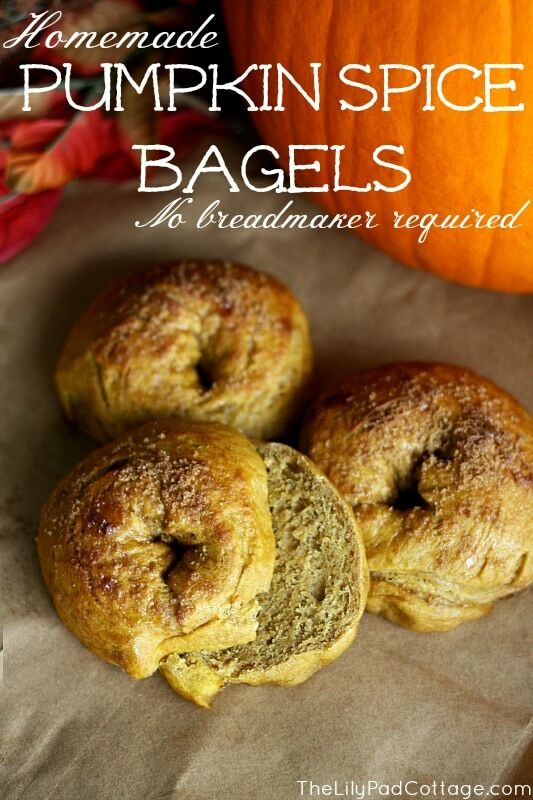 I know making your own bagels sounds complicated, but I promise it really isn’t hard. Plus if you have kids it’s a fun project for them to help with! First you will make your dough (follow the recipe below), I used the dough hook on my mixer, but the Mr. usually kneads his by hand being the manly man he is… Let it rise for one hour, punch down and divide into 3 equal pieces. 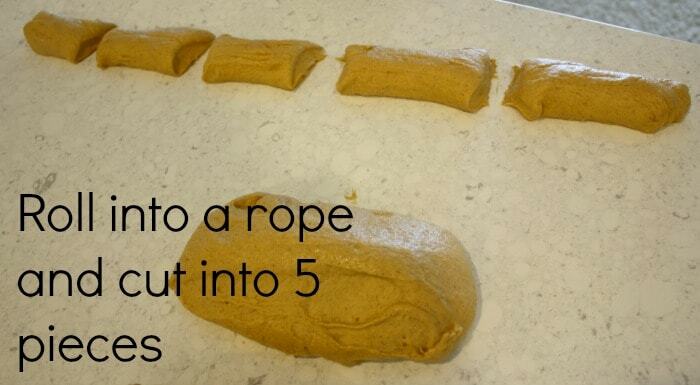 Roll into long lines and cut into 5 pieces. This recipe makes 15 bagels, which seems like a lot, but trust me you will eat them all. 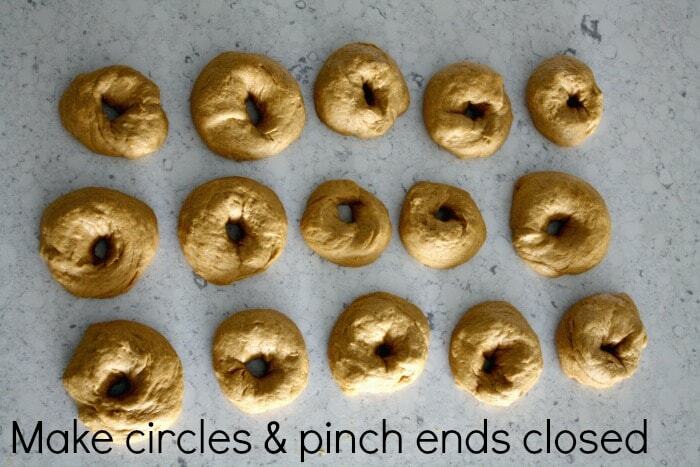 Shape into bagel shapes and pinch the ends. Let rise again 20 minutes. Boil for 1 minute turning once. Bake at 500 for 10 – 15 minutes, watch “patiently” asking every 30 seconds “are they done yet mom???”…enjoy! PS My blogging buddy Kelly’s living room is being featured over at Apartment Therapy in their Color contest, if you have a second go check it out and vote! Mix flour, cinnamon, apple pie spice, salt and yeast in a mixer. In a separate bowl mix pumpkin, ⅔ C brown sugar and warm water. Make a well in the dry ingredients and add the wet. Stir until a dough forms. Knead for 10 minutes or use the dough hook on your mixer until a firm dough ball forms. Place in an oiled bowl, turning once to coat the whole dough ball in oil. Cover with plastic wrap and let rise in a warm spot for 1 hour. Punch down and knead a few times. 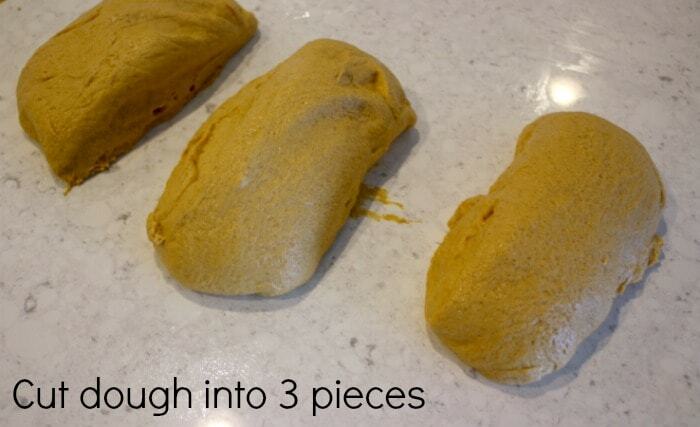 Cut into 3 pieces. Roll each piece into a long roll. Cut into 5 pieces. Form into circles and pinch ends together. Cover with a towel and let rise 20 minutes. Meanwhile start a large pot of water to boil, add 2 tbsp brown sugar. 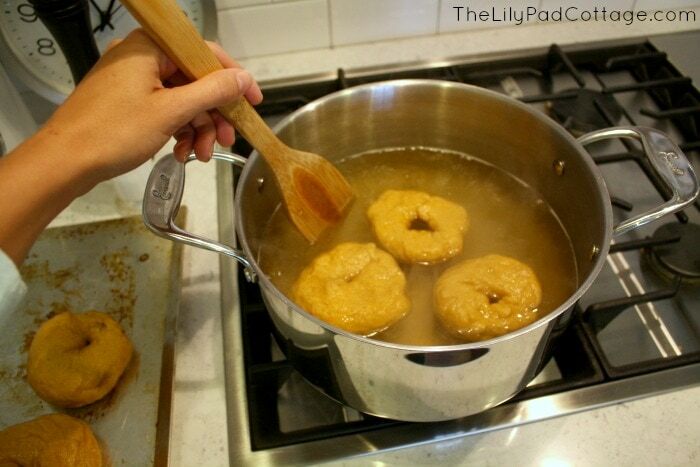 After the bagels have rested and are nice and puffy drop a few bagels at a time into the boiling water. Poach for 1 minute turning once with a wooden spoon. Set on a greased cookie sheet. Sprinkle with cinnamon sugar topping mixture and bake at 500 for 10 - 15 minutes. Sounds delicious!!! What an amazing husband. YUMMO! These look delish ! Thanks for sharing! These sound, and look, amazing!!!! These look really yummy. Will have to try them. Those look wonderful, Kelly! Why is it, though, that it’s so impossible to get homemade bagels to look smooth? Mine always look so puckered and wrinkly (WAAAAAY worse than yours, which are lovely). I’ll have to try this recipe. I can’t get enough pumpkin spice. Oh, and you know one thing I miss about Michigan? Being able to get pumpkin puree whenever you want it. Ridiculously, our grocery stores here in Florida only stock pumpkin from October 1 through Thanksgiving weekend. Isn’t that the dumbest thing ever? Thanks for the tutorial – I love this! So perfect for the fall season! P.S. 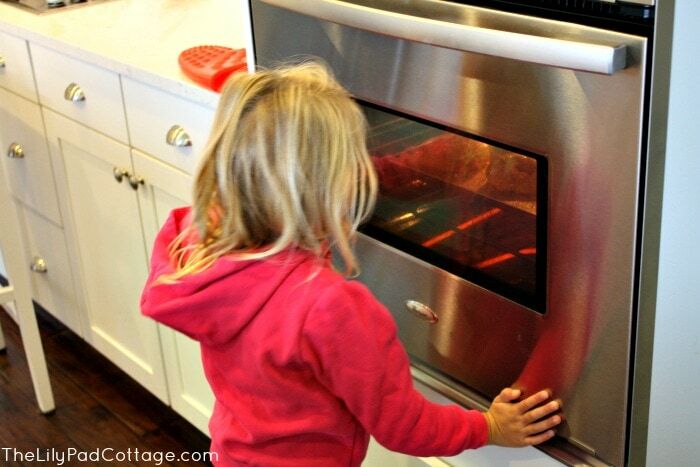 The pic of your daughter peeking in the window of the oven is precious! Definitely going to make these! Just one question about the poaching: do you poach for a minute, flip, then poach for another minute? Or do you poach for a minute total, turning halfway through? I made these but without the pumpkin (didnt have any on hand) and they came out so good!!! I’ve already had 3…. Hi there! I know you posted this over a year ago, but I just found the recipe on pinterest. I am making it now but have a question. Is the dough supposed to be very sticky? I’m having a hard time rolling it out and shaping the bagels. They look like big, uneven lumps. Any advice? Should I have mixed it with dough hook longer? (I did it for 10 minutes, but starting from the time I added the wet ingredients, not from the time everything was combined. Not sure if that was correct.) Thank you in advance! Oh hmmm! I don’t remember at all, I’m so sorry! I haven’t made these in a long time, maybe add a bit more flour? No worries and thanks for the reply. I ended up using flour on my working surface and on my hands to handle it and that helped. I’ll try more flour into the dough directly next time. And there will be a next time. Wow, these were good! What a fantastic recipe, thank you so much for sharing! I had to freeze them to stop myself from eating them one after another! Thank you so much for the wonderful recipe. 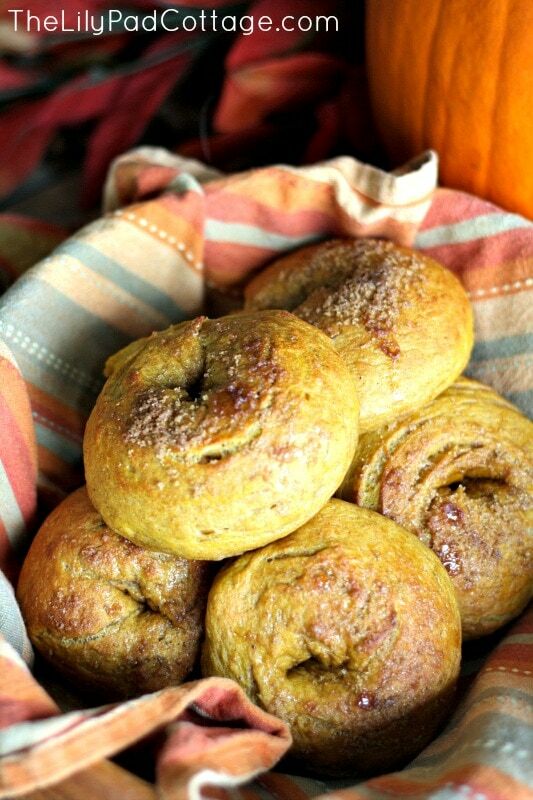 I made these yesterday using fresh pumpkin and pumpkin pie spice instead of apple pie spice and these bagels made the list of best things I have ever made. I also used a bit of pumpkin pie spice in the topping. Thank you so much for sharing the recipe. Oh great, so glad you liked them!